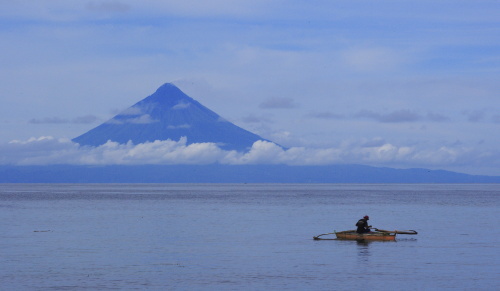 A lone fisherman goes about his daily chore of catching fishes, unmindful of the grandeur of Mayon Volcano behind him. Mayon Volcano in Bicol, Philippines, is famous the world over for its perfect cone. This view is taken from Caramoan using Canon IDs Mark II and a 70-200mm 2.8L lens.